As you may have noticed, I upgraded to the current version of Blogger a week or so ago. It’s made the site a little more functional, I think, although my StatCounter stats are screwed up. Either that or there are 90% fewer people visiting, which is entirely possible. It’s been a weird few weeks around here. The Best Wife Ever and I have been pretty busy with our real lives. My parents visited for Thanksgiving. The leaves need raking. We went to Grand Illumination, the kickoff of Colonial Williamsburg’s Christmas season. That doesn’t leave a lot of time for blogging about new comics. Actually, I’ve been reading a lot outside the Wednesday hauls, and that’s taken time away from the weekly roundups too. Last week it was The League Of Extraordinary Gentlemen: The Black Dossier and I Shall Destroy All The Civilized Planets!. I got Showcase Presents The Brave And The Bold Batman Team-Ups for my birthday last month, and Wednesday I got Showcase Presents Sgt. Rock. So far, all of them have been pretty entertaining, although Black Dossier was fairly self-indulgent. Of course, I’ve been keeping my regular Thursday deadlines for Grumpy Old Fan, and as I mentioned in a comment on today’s post, odds are good that I’ll finish the magnum-opus Grand Unified Theory of DC Comics — my own Black Dossier, probably, with all that implies — before too long. I’m a little frightened by the thought of that, and you should be too. — Are there still formal “ship weeks,” i.e., where Batman ships reliably on, say, the second week of every month? 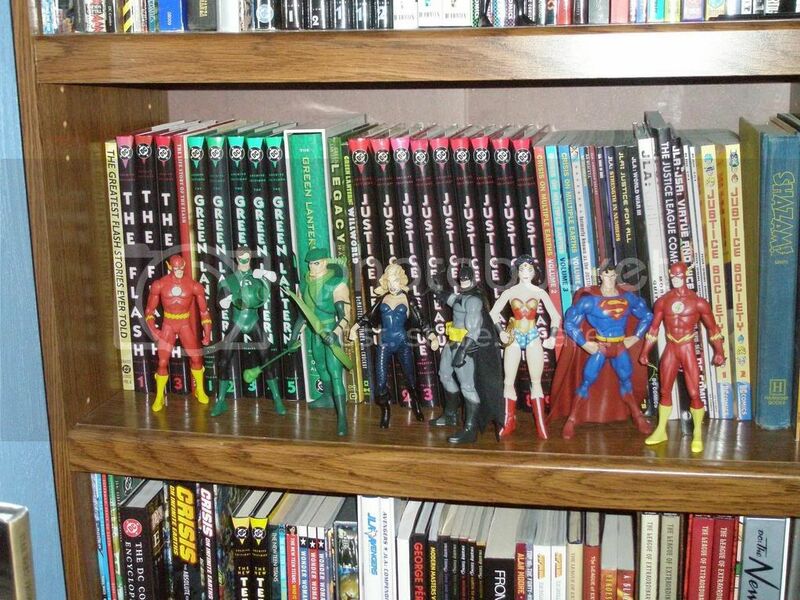 — How late have DC’s books been, really? How does that compare to Marvel, Dark Horse, and/or Image? — What should fill the slots all these Countdown miniseries will leave behind? — Is a variant cover a slot-filler? What about a second printing? You get the idea. I still think a lot about comics, even if those thoughts don’t make it to this blog. I just wanted you to know I haven’t turned this space into a series of scans (although I like doing the scans too). It might not be this weekend, or next week, but before too long, I hope to be filling this space with long-winded tirades about superhero esoterica, just like old times. Let’s see if I understand the development of DC’s cosmology. 1. In the Original Beginning, right after the Big Bang at the Dawn of Time, a Giant Cosmic Hand spins the first building blocks of the Universe into their starting places, as if casting bread crumbs on a lake. There’s also a single antimatter universe. 2. Millions of years later, the Oan scientist Krona attempts to observe this event, but ends up unleashing Evil on the universe. Krona’s interference also reaches back to the Dawn of Time and retroactively creates a Multiverse of infinite worlds. 1. In the Multiversal Beginning, right after the Big Bang at the Dawn of Time, a Giant Cosmic Hand spins the first building blocks of the Multiiverse into their starting places, as if casting bread crumbs on a lake. Each parallel universe occupies the same space, but vibrates at its own unique frequency. There’s also a single antimatter universe. The planet Oa is unique to the universe of Earth-1. 2. Millions of years later, the Oan scientist Krona attempts to observe this event, but ends up unleashing Evil on the universe. 3. Millions of years after that, the Earth-Omega scientist who will become Pariah conducts his own disastrous experiment. It wakes up the Anti-Monitor and results in the first universal casualty of the antimatter wave. Pariah survives, immortal and alone. 4. Eventually, the antimatter wave gets to the last dozen or so worlds that people have actually heard of. This causes the Monitor to get off his duff and start recruiting heroes from these worlds to fight the Anti-Monitor. Of course, these events are depicted in Crisis On Infinite Earths. 5. Harbinger kills the Monitor just before the universes of Earth-1 and Earth-2 are wiped clean. Psyche! The Monitor’s death has turned his energies into a backup disk for these two universes. Soon afterwards, the universes of Earth-4, Earth-S, and Earth-X are cut and pasted onto the backup disk. Problem is, it’s only a temporary solution. The whole thing must be restarted. 1. In the Post-Crisis Beginning, right after the Big Bang at the Dawn of Time, a Giant Cosmic Hand spins the first building blocks of the Universe into their starting places, as if casting bread crumbs on a lake. There’s also a single antimatter universe. Here’s where it starts to get tricky. If Pariah was originally from another Earth, where’s he from now? If an antimatter wave wasn’t destroying parallel universes, what was it destroying? In other words, how was the post-Crisis Crisis different? 3. The post-Crisis Crisis happens. Lots of people die. Things Are Never The Same. 4. After the Crisis, “waves of time” cause random changes in order to facilitate the rebooting of several superhero titles. 5. The events of Zero Hour, too complicated to summarize here, bring all these time-anomalies to a head. A small group of heroes tries to prevent the unbalanced Hal Jordan from restarting the universe in his own image. They succeed, but guess what? 1. In the Post-Zero Hour Beginning, right after the Big Bang at the Dawn of Time, a Giant Cosmic Hand spins the first building blocks of the Universe into their starting places, as if casting bread crumbs on a lake. There’s also a single antimatter universe. 3. The post-Zero Hour Crisis happens, probably not too differently from how the post-Crisis Crisis did. Lots of people die. Things Are Never The Same. 4. Things go on fine for a while, until a) in DC One Million, the Justice League takes a trip into the 853rd Century to meet up with Superman, who’s still alive and (it turns out) immortal, and b) in The Kingdom, a villain from the future shows up in our present to kill Superman, having already killed boatloads of Supermen on his way back in time. This leads to the discovery of Hypertime, which basically says all the old stories still exist, just like they originally happened, in their own cubbyholes of space, time, and dimension. The thing is, they’re just really really hard to access. There’s a suggestion that the Earth-2 Superman, relegated to “not dead, but still gone” limbo at the end of COIE, is still alive and punching on some Hypertime dimensional wall. 5. Nobody much likes Hypertime. 6. Instead, ZOMG!!1!! the four COIE survivors — Superman (Kal-L) of Earth-2, his wife Lois Lane Kent, Alex Luthor of Earth-3, and Superboy (Kal-El) of Earth-Prime — have been biding their time in the years since COIE, waiting to spring into action and fix all the bad stuff which has befallen their beloved Universe. Alex Luthor hopes that by recreating the Multiverse, the infinite monkeys on their infinite typewriters will come up with the perfect Earth that won’t need changing or revision, ever. 1. In the Post-Infinite Crisis Beginning, right after the Big Bang at the Dawn of Time, a Giant Cosmic Hand spins the first building blocks of the Universe into their starting places, as if casting bread crumbs on a lake. There’s also a single antimatter universe. Additionally, all the excess energy from the aftermath of Alex Luthor’s experiment creates 52 additional parallel universes, each occupying the same space as New Earth’s but inhabiting its own vibratory frequency. The histories of these 52 are altered radically by the intervention of Mr. Mind. 2. Millions of years later, the Oan scientist Krona attempts to observe the creation of (as far as he knows) the Universe, but ends up unleashing Evil. 3. The post-Infinite Crisis Crisis happens, probably not too different from the Post-Crisis Crisis. Lots of people die. Things Are Never The Same. 4. Hypertime is discovered, as before. 6. Apparently there are now 52 Monitors. They are dedicated to cleaning up all the anomalies. And here we are. I know it doesn’t quite account for Animal Man. Still, does it all sound right?